Mariano Marcos Terena, is the son of the Xane’ Pueblo, from the region of Aguas del Pantanal, between Brazil, Bolivia and Paraguay. A Brazilian national born in 1954 he is a Xane’ leader who has devoted his life to working and organizing for the rights of indigenous people and for the earth itself. In 1977, Marcos founded the first indigenous political movement in Brazil, the Union of Indigenous Nations. In 1992 he organized a landmark event in the struggle for indigenous peoples’ rights, the World Conference of Indigenous Peoples on Territories, Environment and Development. 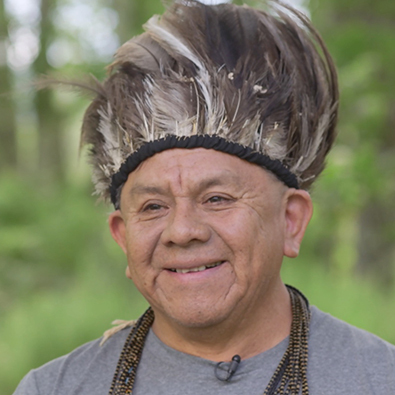 At this historic gathering, Marcos was chosen by over 700 indigenous leaders from around the world to deliver their message to world leaders at the United Nations Earth Summit (UNCED). Marcos is also a founding member of the Inter-Tribal Committee, Land is Life, the International Alliance of Indigenous-Tribal Peoples of the Tropical Forests, the Brazilian Indigenous Institute for Intellectual Property, the World Indigenous Games Festival, and the Call of the Earth Circle. He founded the Union of Indigenous Nations (UNIND), and was involved in the process to include indigenous peoples rights in the Brazilian constitution. Marcos has advised Ministers and official sectors of Brazil on Indigenous people matters. The relevance of his work is well known in International forums such as the United Nations, the Organization of American States, and the World Intellectual Property Organization where he has acted as adviser and spokesman on behalf on Indigenous people movements. Among others, Marcos was involved in the following initiatives: the creation of the UN Permanent Forum on Indigenous Issues, coordination of the Forum for the Protection of Traditional Knowledge in Brazil and jointly with the World Intellectual Property Organization (WIPO) and he also coordinated the indigenous people panel in Santiago +5 Conference on Racial Equality. Besides being the creator of Indian Voice, a radio program, Marcos Terena has also commented about indigenous rights in various television programs. He has written two books: The Indian Aviator and The Citizens of the Jungle. Marcos Terena speaks about receiving the Wisdom Fellowship Award.